Join us for the next meeting of the Black Studies Graduate Research Group, a reading and writing collective for grad students interested in intellectual community and examining key and emerging texts in the field of Black Studies. 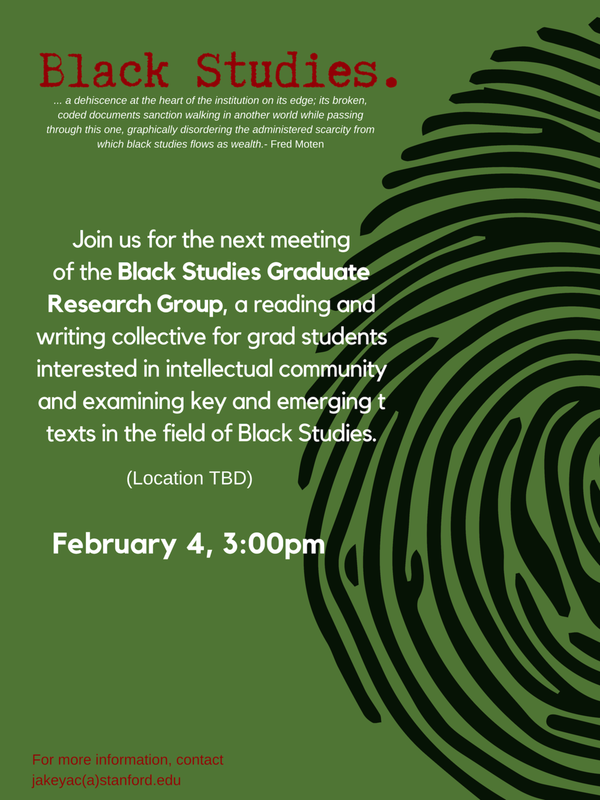 Join us for the next meeting of the Black Studies Graduate Research Group, a reading and writing collective for grad students interested in intellectual community and the examination of key and emerging texts in the field of Black Studies. Join us for the first meeting of the Black Studies Research Group, a reading and research group for grad students interested in examining key and emerging theoretical texts in the field of Black Studies. For more information, contact Umniya Najaer: umniya.najaer(a)stanford.edu or Jakeya Caruthers: jakeyac(a)stanford.edu. As part of “Conjure Art 101: Performances of Ritual, Spirituality and Decolonial Black Feminist Magic,” Marvin K. White will be giving a dynamic, interactive lecture. Drop in for a consultation with AAAS staff to strategize about internships, fellowships, grants, and job opportunities to pursue next summer and beyond! Join us for a talk with Prof. Steven O. Roberts on the extent to which U.S. Christians conceptualize God as a White man, and the extent to which this concept advantages White men and disadvantages Blacks and women. Join African & African American Studies for a special community viewing of the Stanford Production of “A Raisin in the Sun.” The evening will also feature a talkback with cast members and Vice Provost Harry Elam. You don’t want to miss this! Join the Women's Community Center for its first teach-in of the year featuring AAAS Research Fellow, Dr. Jakeya Caruthers! A weekly, intimate lunch discussion about issues related to the African Diaspora. Led by leading Stanford faculty across disciplines and departments. Each Thursday, September 27-December 6. This event is open only to Stanford students. Join current and former AAAS students in Ujamaa’s Drake Lounge for dinner and informational discussion about majoring/minoring in AAAS! Join us for a talk given by author & founding National Director of Black Youth Project 100, Charlene Carruthers on Freedom Dreaming In The 21st Century: Political Participation & Transformation. As we approach the midterm elections, this talk will discuss the carceral state, political transformation, and historical underpinnings of disenfranchisement. Join us for a talk and Q&A at 4:30pm in the Black Community Services Center. An afternoon reception announcing exciting new initiatives and welcoming students, faculty, staff. Brian Stelfreeze joins us to share sketches, stories, and brilliant insight on visual poetics, Diaspora politics, world-making and the origin of Wakanda's kimoyo bead. In celebration of Black History month, join us for and evening full of live music, poetry, and community as we celebrate lesser known works by black poets and writers. Lauded by the Washington Post for their "quick takes on pop and political culture," Damon Young and Panama Jackson join AAAS for an interactive public conversation on race, politics, media and contemporary culture. This is the second installment of our Race Rights and Resistance series. A small cohort of students and staff journeyed to Los Angeles to visit the exhibition "We Wanted a Revolution: Black Radical Women: 1965-1985," at the California African-American Museum.